Rhubarb Mess is the alternative to the traditional Eton Mess, which replaces the traditional strawberries with delicious Spring Forced Rhubarb or alternatively, outdoor grown summer. I know many dispute the whole origin of the traditional Eton Mess as an urban myth; I must admit, though , it is a sweet story. At the famous Eton College, a Labrador dog reputedly, sat on a picnic basket in the back of a car and squashed a strawberry and meringue dessert. It was thought the "mess" was really, rather delicious and the name stuck. 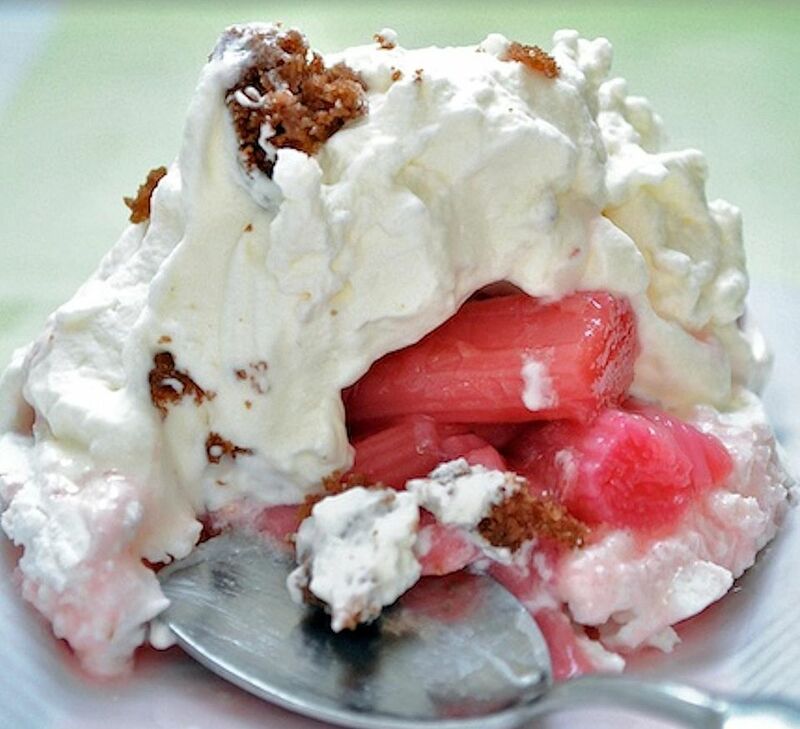 In this Rhubarb Mess, the whipped cream and the crushed meringue are still there as in the traditional dish but finished off with crumbs of a ginger biscuit or a ginger cake as the ginger flavor marries beautifully with rhubarb. The rhubarb is fresh, seasonal and plentiful in the summer in Britain so should be enjoyed to the full. One of the most appealing factors of this dessert is it is supremely easy to make and especially if you use ready-made meringue nests which you can crush by hand, I don't recommend using a Labrador dog. Using either a hand or stand mixer, whip the cream with the icing sugar until it reaches slightly firm, but not stiff, peaks. Take care not to over whip or you run the danger of the cream turning to butter. Lightly crush 2 meringue shells, do not over crush, you want chunks of meringue, not powder. Fold gently into the cream. Place the meringue nests into the center of 4 dessert plates. Drain the roasted rhubarb through a fine sieve, reserving the juice (if you don't have roasted rhubarb don't worry, use stewed or rhubarb compote). Pile a generous serving of rhubarb onto the top of each of the meringue shells. Then top with equally generous dollops of whipped cream and crushed meringues. The traditional mess uses strawberries but really, it is a lovely vehicle for many soft fruits. Rhubarb as above, but consider using seasonal, fresh, Scottish raspberries, blackberries, bilberries, in fact, any soft summer fruit. Avoid and hard stones fruits unless stewed down.